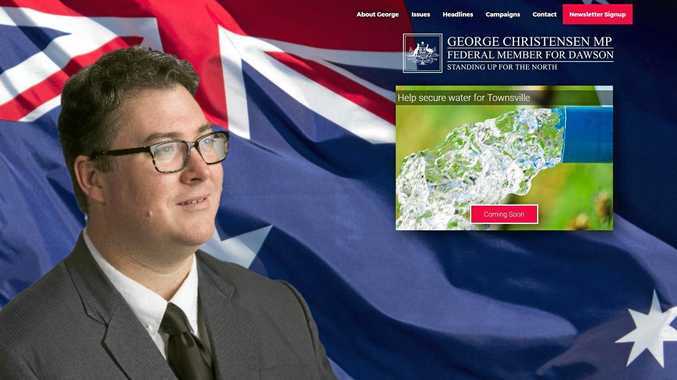 REFERENCE to the LNP has been removed from Dawson MP George Christensen's communications, with new slogans and logos fuelling speculation about his future with the party. The rogue MP, who has clashed repeatedly with his own government this term, has also started a new conservative online journal called Australia First. It is reminiscent of Senator Cory Bernardi who first launched his political party Australian Conservatives as a right-wing group in July 2016, before defecting from the Liberal Party in February. But Mr Christensen said he was not preparing to split and was simply doing a website and social media overhaul. "The changes are simply to get conformity in my own branding across all online platforms," he said. "(The) website is still in beta mode so changes including logos are coming." If he were to leave, it would be a blow to the Turnbull government which holds power with a majority of one seat. Documents show Mr Christensen registered Australiafirst.com.au on Saturday, and his social media presence updated with new logos on Sunday. His personal website, no longer bearing LNP logos or references to the party, talks about "defending the national interest" as well as "standing up for workers, small business owners and farming families". Last December Mr Christensen warned that unless the government changed its path there was only so long he could "remain inside the tent" without a new way of doing things. "What the Turnbull government needs to do is start being more loyal to the voters and the party members who sent us here, or there will come a time when remaining inside the tent is no longer tenable to my conscience or my voters," he posted in December. His personal website now describes him as "an Australian Member of Parliament who serves the Dawson electorate in North Queensland". The Australia First website says the online journal will mobilise support for "Australian values and our democratic, free way of life, our nation's history and heritage against black armband revisionism", as well as secure borders and the defence force, farmers, industry, small business and workers. After several threats to cross the floor, Mr Christensen gave up his position as Nationals chief whip so he could speak more freely.